Postmodern takes on fairy tale tropes aren't new. In comics there's Fables, the big screen gave us Enchanted and Tangled, TV had The Charmings and the musical stage, Into the Woods. 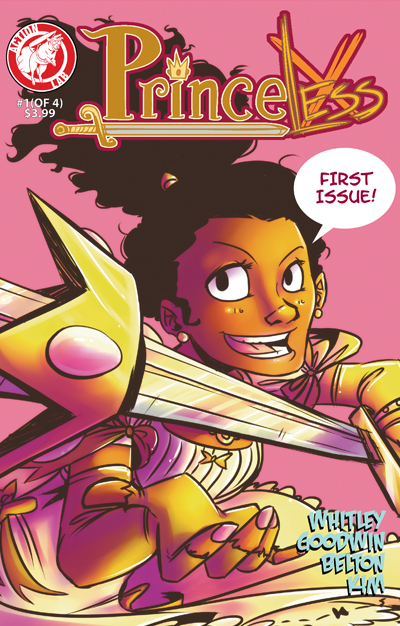 That doesn't mean there's no room for another entry in the mini-genre, especially when it's as good as Princeless #1, which is barbed yet affectionate, funny, smart, and like any good fairy tale prince, charming. The story begins with a bedtime story read by a Queen, familiar stuff about a young royal rescued from a tower by a prince who slays a dragon. Princess Adrienne isn't impressed, pointing out such plot holes as a supposedly mighty dragon that can be killed with one blow and the lack of any sane motivation for locking up a sweet young thing. Mother isn't impressed by the questions, insisting that lots of families put their girls in towers ('They want only the bravest suitors for their daughter'). - one day the old girl's going to end up on the wrong end of a prince's blade, collateral damage in a twisted economic system - Adrienne sets off with her new partner to first prevent her youngest sister becoming the next prisoner, then free her elder siblings. Meanwhile, the most recent Prince to fail is thrown into a pit by her father, while her brother Devin is considered too unmanly ever to inherit the throne. Jeremy Whitley's pacy, nicely structured script in this first of four parts is fluffy yet cutting. Adrienne is a delightful protagonist - intelligent, plucky and funny, trapped - like Howard the Duck - in a world she never made. Whatever else happens, I hope her parents get their comeuppance, whether that means tower or pit, and Sparks her freedom. The full-colour art by Mia Goodwin is gorgeous, cute but with a sharp edge to match the script - there's a real spark to Adrienne that has me cheering her on. And Jung-Ha Kim does a fine job with the lettering, and colours on the book's back-up. Said back-up, Mr Froggy, shows how Prince Wilcome is sent to Prince Charming's Charm School for Future Kings, to learn how to ride, fight and wear his hair in a bouffant. Full of bravado, he travels to the tower of the latest princess up for rescue and ... winds up in a dungeon. Yep, this is the chap from Adrienne's tale, now in need of rescuing himself. Will the princess he so carelessly annoyed come for him? It's another attractive script from Whitley, with energetic artwork from DE Belton, showing that handsome princes, like princesses and dragons, can be victims too - if not so much. Out in October and available for order in the August Previews, Action Labs' Princeless is a splendid palate cleanser for superhero lifers like me. I can't wait until it's collected - it's the perfect gift for your little princess. Especially if she's in a tower, bored.